Note this will be deprecated in the future. Use internal ACL authorization instead. It will be fully supported in XorMon (LPAR2RRD and STOR2RRD product merge). Since v4.70 the product supports Active Directory authentication and resource authorization. You can assign LPAR2RRD resources to already existing groups in AD which will be accessible (visible) only for users in particular groups. 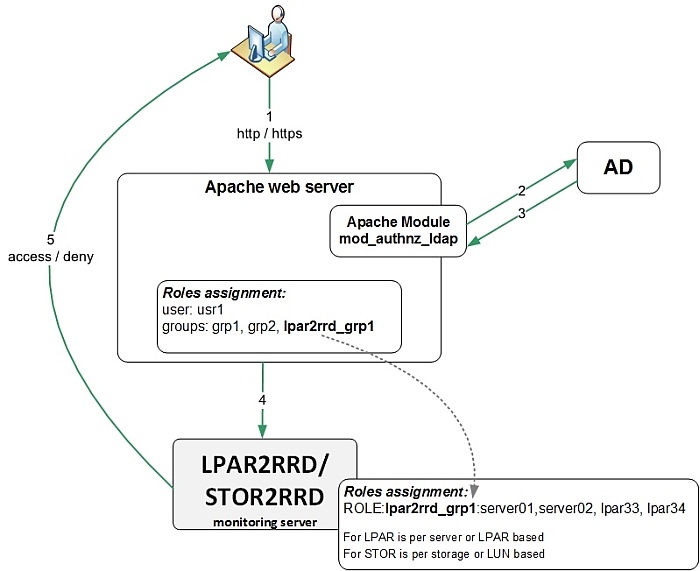 One group is used for resource access administration in LPAR2RRD. This allows you make visible only such LPAR2RRD resources which is every user authorized for. You can allow to every particular department to see only resources which they are authorized without having full access to the product.